It’s been almost two decades that I took over the restaurant in my twenties, when I had ideas, plans and dreams. In the beginning perhaps I could not precisely define those goals and the way to accomplish them, which since then were consciously and consistently built by me, the gastronomic culture and scene was also well different. Then something started. Owing to one of my guests, who is a world traveller, and with whom we are in close friendship ever since, my interest to know about restaurants abroad grew intensively. We had many long discussions and later started to go on culinary „study” tours. The world opened up and based on experiences, observations and international examples it slowly appeared to me clearly, what type of a restaurant is my vision. Chef László Jahni and the entire team of the restaurant without doubt had a huge role in accomplishing this, without them we would not be where we are now today. 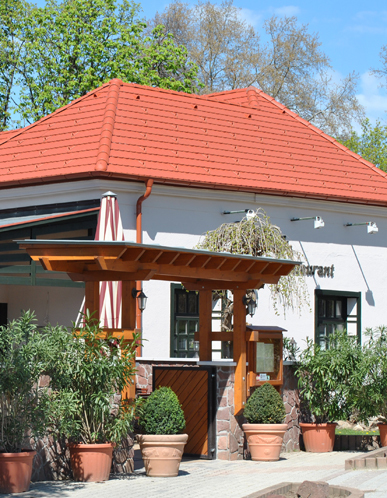 I think that the honourable title, that Kistücsök (Little Cricket) is within the best ten restaurants in the country, as well, that I was voted for the restaurant owner of the year 2010, reassures me, that we are on a good track. We would like to speak about our region, our lake Balaton, through our meals and wines. Respecting the tradition and the ingredients is of utmost importance for us, seen as our roots, at the same time, we keep an eye on their renewal and innovation. It is important for us to understand them and to speak about them, this is why we aim to take part in the Hungarian gastronomic scene. We encourage the use of ingredients of our region, we keep close and trustful relation with the local producers, fishermen and wineries. Our mission is to connect all of these and thus help to restore, the wine and food culture, to its place, here, locally as well. Travelling still has an important role in my life. During winter, when the restaurant is quieter, or, just when I need some recreation, together with my wife and my son, Bence, maybe just for a day, we leave to get into the spirit of the art of the Mediterranean cuisine. Most often we travel to Northern Italy, which is only few hours’ drive from us. I look up Walter Filiputti’s book Friuli: The path of flavours, and we look for the next travel destination. We travel to the given town, sit outside the main square, and try their wines, local ham and cheese, and I talk to the local restaurant owners. I am fascinated by how people love life, how easy-going they are and last but not least, the casual atmosphere of the restaurants. My dream is, to create the same feeling and gastronomic culture in our restaurant. I would like for our guests who come back to feel like at home. I have several plans for the coming years. I believe that – together with my team – we make all of them come true, nice and slowly, step by step. Until that time, we are happy to see You, here at us, at Kistücsök (Little Cricket)!